The Valley ICON10 features the largest touchscreen in the new ICON line of smart panels. It’s similar to using the touchscreen on your tablet, but now it’s on your center pivot. The Valley ICON5 features a smaller, 5-inch touchscreen interface with soft keys that mirror the touch control functions. The Valley ICON1 is a remote access control panel for pivot irrigation. With no display screen at the pivot point, the ICON1 is controlled exclusively through a remote interface. The Valley ICONX takes control of existing center pivot panels, no matter the pivot brand, using the panel’s circuits and delivering full ICON touch control. Now, all of your center pivots can be on one network. AgSense ICON Link is a new remote management module designed exclusively for Valley ICON smart panels. 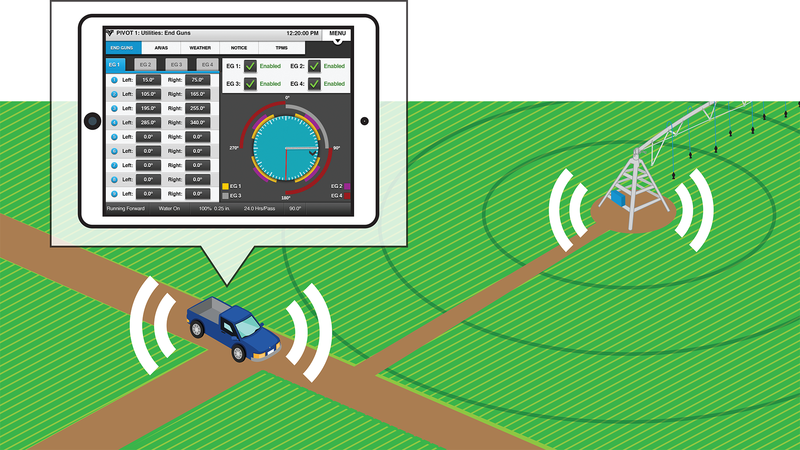 Control from the edge of your field has never been so easy with Remote Device WiFi Access. Quickly switch between pivots to send commands and adjust controls, all from the ICON app on your tablet or smartphone. Available with ICON10 and ICON1. As a grower, you know getting water to your crops when and where it is needed is the key to your best yields. In the past, this may have meant additional costs and worries during peak irrigation times: early morning center pivot checks and increased fuel costs from additional trips to the fields. Valley® control panels are designed to eliminate these unnecessary visits to your field and help you regain control of your irrigation. Over the years, we've listened to your needs, and we continue to offer control panels and irrigation technology for all kinds of growers and irrigation equipment. Only your local Valley dealer can give you the best advice on which control panel is right for you. Find your dealer today!